New Horizons spacecraft took this image of Pluto on July 13, 2015, at a distance of 476,000 miles (768,000 kilometers) from the surface. The color image uses lower-resolution color information from the Ralph instrument acquired earlier on July 13. The veil has been pulled back from the surface of Pluto: a jaw dropping new photo of the dwarf planet taken by NASA's New Horizons probe reveals never-before-seen details, and it's only the beginning of more amazing photos to come. The new image was the last snapshot taken before New Horizons went quiet in anticipation of its close flyby of Pluto, which was scheduled to take place early this morning (July 14). The photo shows two major features on Pluto's surface that have been coming into view over the last few weeks: a large, bright, heart-shaped feature and the head of a darker region that is unofficially being called "the whale" (lower left). The incredibly detailed snapshot also reveals other, previously unseen geologic features on the dwarf planet's surface. New Horizons' closest approach to Pluto was scheduled to take place at 7:49 a.m. EDT (1149 GMT) today (July 14), but the mission team won't know until this evening whether or not the probe reached its target. Contact with the probe ended, as planned, at 11:17 p.m. EDT Monday night (July 13 —0317 GMT July 14). Mission representatives will hold a press conference tonight at 9 p.m. EDT (0100 GMT July 15) on NASA TV to report on the outcome of the probe's close approach. The spacecraft's "flyby sequence" of Pluto continues through Thursday. The image was taken with the Long Range Reconnaissance Imager (LORRI) aboard New Horizons, and combined with lower-resolution color information from the Ralph instrument. 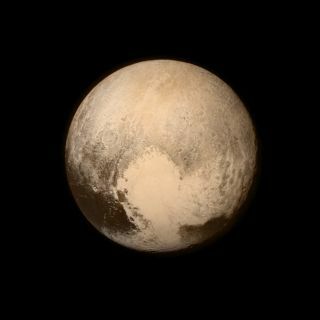 Taken on Monday (July 13), the picture is "the last and most detailed image sent to Earth before the spacecraft's closest approach to Pluto on July 14," according to a statement from NASA. Pluto's "heart" feature measured approximately 1,000 miles (1,600 kilometers) across, and appears "remarkably featureless," the statement said, "possibly a sign of ongoing geologic processes." This morning (July 14) at the Applied Physics Laboratory (APL) in Laurel, Maryland (mission headquarters for New Horizons), mission team members, guests, members of the press and the general public counted down to the exact moment of the probe's closest approach. The crowds of people erupted in cheers and applause, and waved American flags, when the moment finally arrived. "I haven't had very much sleep," said Alice Bowman, New Horizons' mission operations manager, at a press conference following the celebration. "But I have absolute confidence that [New Horizons] is going to turn around and send us that burst of data and tell us that it's OK. So I guess it's a mix of feeling nervous and proud at the same time."